Michele: Well, Lisa, we’ve had a bit of history since meeting in cyberspace at the October 2007 Muse Online Writers Conference. So much has changed for all of us! Your poetry workshop in 2008 was so powerful, it literally burned out your internet connection on that last day of chats. As I tap-danced my way through a room full of writers from all over the world, we decided to let you know what we were taking back with us from the intense week. Last November, Lifelines was published, the culmination of our efforts following the workshop. Did you ever think we’d be having this conversation, in this way, and this time? Lisa: I had no idea what I was starting when I signed into that first workshop. I never expected that we would later meet up in various states. Now it makes perfect sense that we are writing to each other, with each other, and in one another’s spaces. What do you think helped us succeed when so many drop by the wayside? It seemed to me that you all immediately appreciated the potential of your sharing. Our workshop exercises asked you to step back and really listen to your work, yourselves, and each other. But you trusted each other, or at least wanted the possible outcomes enough to take risks together. We learned so much from you — what might we have taught you in return? I was humbled to hold an early version of your manuscript, which would eventually become Lifelines, in my hands. It was the culmination of your shared perseverance and vulnerability. I was grateful to have witnessed its creation, even from afar. You taught me to remain open-minded with respect to what others may achieve. As you know, I see connections in even the not-so-obvious places. When people “take root” in each others’ lives, all kinds of things are possible. For me, connection has always meant to witness another person, to see, acknowledge and respect what’s important to them. I like how Dr. Brené Brown defines connection as ‘the energy that exists between people when they feel seen, heard, and valued; when they can give and receive without judgment; and when they derive sustenance and strength from the relationship.’ I find her use of the word ‘sustenance’ compelling. It seems like an important part of the connection between the Poetic Muselings that became Lifelines. Tell us about Moxie Mavericks — how does one “become” one? And why should one? Moxie Mavericks is the name of my company, my professional life coaching practice. Moxie means gumption, derring-do, etc. But for me it’s a family value with which I was raised. I come from several generations of people who stand by their principles, whether they make us heroes, antiheroes, or observers. We enjoy each other’s stories. And those stories don’t even have to be spectacular, as long as they are real. We simply witness each other’s moxie when we see it. So people with similar values tend to feel at home here. Mavericks are the sorts who get very serious about creating personal meaning in their lives. They are, by definition, out on the very edge of the frontier. It’s important to note that the landscape might be internal. People have special needs when they shift to maverick mode. It gets lonely out/in there. Very often others in their lives don’t see the singular vision that a maverick might have or initially understand the actions he or she chooses. So in coaching we build a space where mavericks can get customized support and feel safe to experiment with ideas. We all have access to moxie and can be a maverick. It’s in there. I know you are passionate about the concept of transition in an individual’s life. What does this mean to you? What are you seeing that’s so exciting? People usually expect life coaching to be about defining their dreams, about setting and reaching goals, and about overcoming challenges like procrastination. Indeed, these are some of the tactical aspects of the work we do in coaching. But what I see over and over in my clients is a desire to make meaning out of a transition, to understand what’s being lost and gained by moving. In some cases, if we rush into goal setting we miss the opportunity to slow down and reflect. Forced goals lack authenticity. They are burdensome rather than enriching. Giving clients space and time for this reflection has deepened and enlivened the experiences my clients and I share. As we talked recently, I envisioned transition as trying to figure out what you need to put in your backpack for a journey — and more importantly, what you must take out and leave out in order to make a transition. That’s the hard part — letting go of what only weighs you down. Any guidance on this? We often don’t know that we are entering the journey of a transition when it begins. Sometimes we realize we are far from “home” only when we feel lost. Something has changed but we don’t know what. We also might not know where we are going next. So it can be tricky to pack in advance. Either way, it helps to have a stash of compassion, for oneself and for others. We are all doing the best we can. We need to be patient with ourselves. This is how we can safely look at what’s holding us down. I won’t pretend that it’s easy work. The second handy item is appreciation for ourselves and others. I work with clients on spotting signature strengths–the ones that offer us the most pleasure and personal meaning when expressed. They make for an internal compass of sorts, one that can be recalibrated as interests change. Where are you going with projects and other aspects of your life these days? People have been asking for retreats so I’m working that out. I understand more fully now how they might be of service. This fall two plays that my husband, Nick, and I wrote will be performed at the San Francisco Fringe Festival. Our program is called “Weird Romance”. We have a wonderful director, cast, and crew bringing our characters to life. It’s quite a treat to have others see your imagination walking and talking under the lights. We love hearing the audience laugh. And what about your future? What’s coming up? I am exploring the vulnerability of stillness. It’s a wild ride. You can’t get away from here without a few words about one of the strangest boat stories I’ve heard in years — and I’m a (somewhat) experienced sailor! What is the project that made you take to the seas, what’s happening with it now, and where do you see it going? You are talking about Spirit of the Sea, a new youth sailing program for which I volunteer. This year we acquired a very special boat as our flagship, S/V Ocean Watch. In February we splashed her, cleaned her up, and sailed her from Anacortes, WA, to San Francisco, CA. 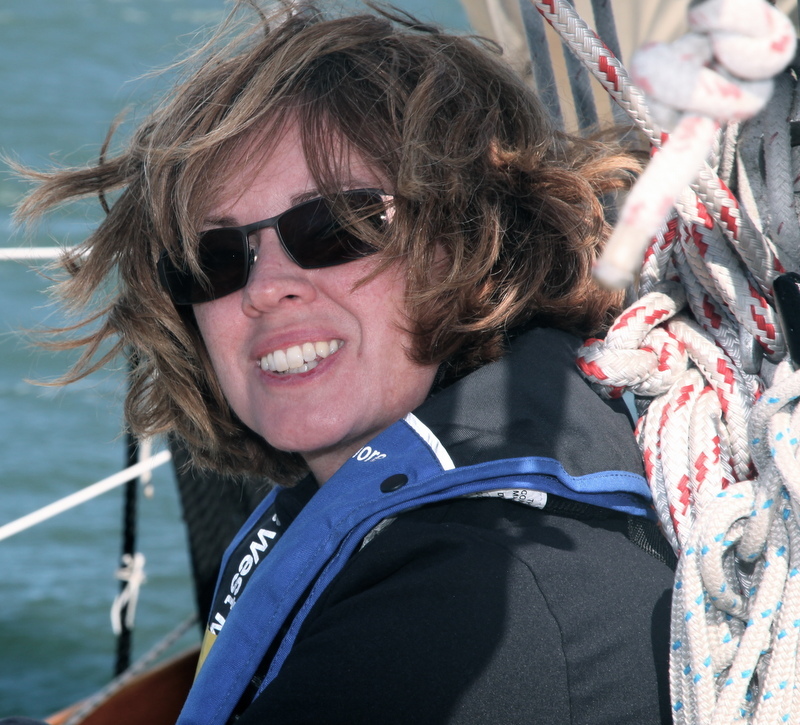 We take youth sailing on the San Francisco Bay at not cost to them. Just participating in the sailing of a boat and experiencing the marine environment can be powerful to our youth. But we’re taking it a step further by offering activities that incorporate experiential education, citizen science, and service learning to connect these kids with critical thinking, mentors, and possible career paths. We hope to instill these young sailors with a sense of agency that will transfer to other domains. That’s exactly what half a dozen insurance agents said. I no longer know why we delivered the boat at that time. To get it done, I suppose. I did it because it was a once-in-a-lifetime opportunity to sail with an incredible group of experienced and moxie-rich sailors, some of whom had become my dear friends. I did it because I had earned it. We had worked hard to get the program to that point and sharing this adventure was a celebration. Also, I was ready for a new way to access information about myself in the world. This is the point of the adventure coaching that I do with some of my clients. This adventure was an opportunity for me to exercise different strengths outside of my daily routine. 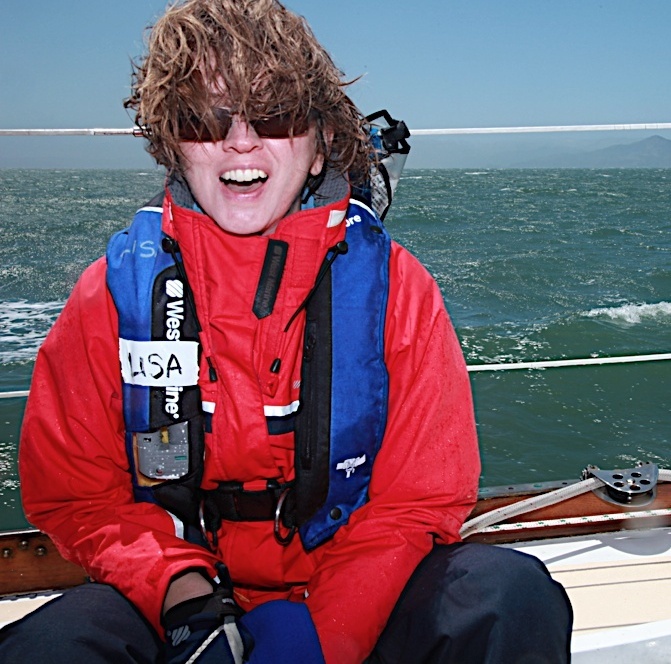 I witnessed first-hand the value of a “game-face” in sailing leadership. It keeps everyone calm and focused. There were many perfect moments. There was a perfect hour of a perfect afternoon. I felt secure with my fellow crew so I was free to marvel at the ever-changing shapes of the waves, patterns of the bubbles, and colors of the waters. And I had some chocolate. I think I felt deeply myself and connected at the same time. But I find that the more I try to look back at these moments squarely, the more they seem to shimmer and dissolve. They are prismatic. So my work now is to remember how these moments felt and stay open to those sensations in the future. Was this a transitional journey for you? It offered key moments in a larger transition. The engine died one morning at dawn, just before a shift change. So everyone was up, exhausted, and busy. While others tracked the problem and rebuilt parts I stayed on watch alone at the helm. We had no wind so we were especially vulnerable. Even once we started moving again, my job was relatively simple: monitor the radar, watch for hazards, make course adjustments, and scan the horizon through the binoculars. But I was absolutely satisfied. I loved that no one checked on me. As the sun came up I studied the beautiful sky and coastline and faced the notion that I had fulfilled, in one way or another, just about every promise that I had made to myself as a kid. I decided to not even review the list, to just let it all be. Now I’m shifting my focus from doing to being. They say you never return from a journey to the same place. When I left I was thrilled that I didn’t know when I would return. I don’t think I’ve quite yet returned. I am practicing patience and expressing my curiosity. Your websites are as eclectic as you are, Lisa — so much more to talk about at a later date! Thank you so much for joining us today! As always, we appreciate your generosity of spirit, wisdom, humor, and that sense of connection we cherish. Good luck with all your adventures. Thanks, Michele. My pleasure, and I look forward to sharing more soon.